Living in Minnesota and being of Swedish descent, my Christmas décor tends to be very Scandinavian in design: red hearts, flickering candles, straw goats, cozy fair isle, and, of course, tomte. Traditionally, a tomte was a domestic sprite who protected the farm. He looked a lot like a gnome with a pointed red head and long white beard. Through the years, the tomte has become more of a Santa Claus figure who delivering presents to children’s homes. 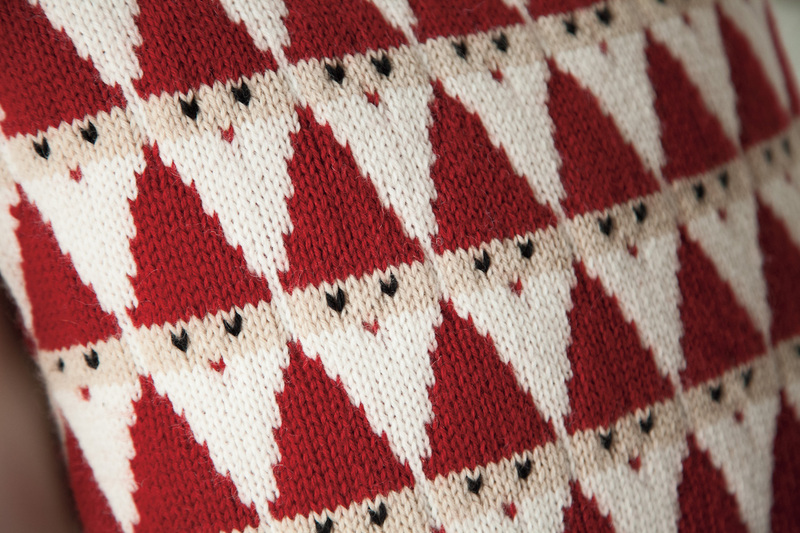 On many modern Scandinavian Christmas decorations, the tomte or Santa is depicted in a very modern, triangular shape. The design for this Santa Pillow was inspired by that clean Scandinavian style. While the pattern is just a series of triangles and rectangles with minimal face details there is still a sense of whimsy to it that makes you smile. The pillow was knit up with Wool of the Andes in worsted weight, so it goes pretty fast. The colorwork is simple especially since I duplicate stitched the eyes on after knitting. One thing I did to keep the red from peeking through the white or cream was keep my floats longer than usual. Since the floats would always be on the inside of the pillow it wasn’t a worry about someone catching them like you would on mittens or a sweater. It was just important not to pull those floats too tight. I have an ebook version of Merry Knitmas to giveaway! All you need to do is leave a comment on this thread on Ravelry telling us what you are knitting for Christmas this year. I will draw one winner from those comments on Wednesday, October 25th. Good luck! If you are not reading this post in a feed reader or at http://justcraftyenough.com then the site you are reading is illegally publishing copyrighted material. Contact us at jcraftyenough AT gmail DOT COM. All patterns, text and photographs in this post are the original creations & property of the author unless otherwise noted. 2 years ago by Kat in Christmas , Giveaways and Contests , Holiday , Home , Knitting , Knitting Projects , Needlecraft | You can follow any responses to this entry through the RSS feed. You can leave a response, or trackback from your own site. This is really cute! Good job! This is brilliant in it’s simplicity!! I am knitting socks & your “Wee Winter Woolens KAL” as my Christmas efforts for this year. Loving the ornaments – my first collection ever. 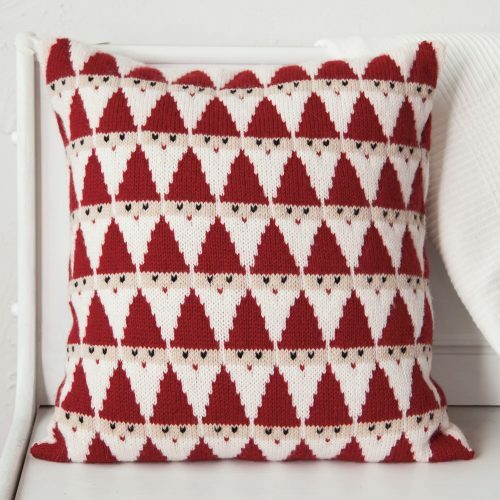 I’d love to buy this pattern but I’m in the UK and can’t seem to buy anything downloadable from KNitpicks is it available elsewhere? I am currently working on the Spuntaneous Worsted Plaitwork Cowl by Nikki Wagner. It is a really easy cowl with an 8 row pattern. I love the pillow design. It would integrate nicely with my Santa collection!! Hi Kat, I can’t seem to figure out Ravelry. Maybe after more coffee 😉 Awesome pillow!!! 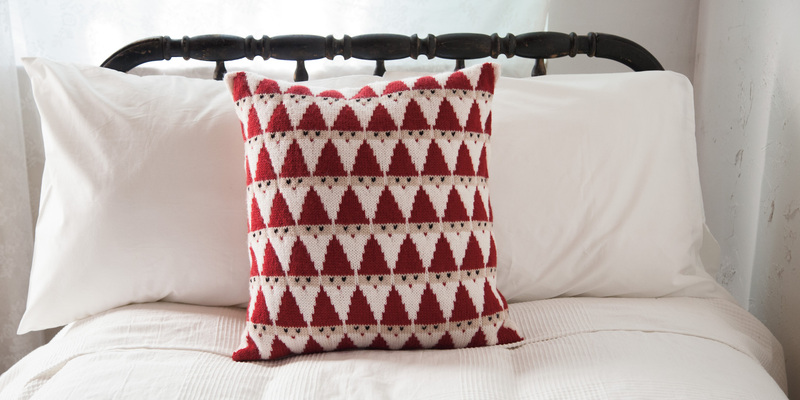 Love the design simplicity of this pillow. Great knitting! I will be knitting this new pillow design of yours! It put a smile on my face the moment I saw it😊 The clean lines and the simple geometric design is very appealing. I am knitting a Christmas Sweater, I hate to say it but it is for myself. Nothing wrong with knitting for yourself in my book! I’ve been seeing this pattern everywhere but didn’t realize you were the designer. It is Adorable! !